Making your own DIY parrot toys is a great way to save some money on pet supplies and offer your bird fun and unique toys! Coming up with cool ideas for homemade parrot toys is easier than it sounds, even if you don’t believe you are the “artsy” type. In this simple guide to homemade parrot toys, we’ll cover awesome ideas for DIY parrot toys you can make at home right now, using supplies you probably already have! Why make DIY parrot toys? In a wild setting, your parrot would never get bored. Every moment would be jam-packed. She would be foraging for food, hiding from potential predators, seeking mates, nest-building, rearing young and resting. But in a captive setting, a parrot can have trouble filling the hours! So DIY parrot toys for a pet parrot are not just a nice “extra,” but necessary for enrichment. This is especially true if you don’t want your inventive, intelligent parrot to decide that your crown molding or kitchen table looks like the perfect chew toy. Parrots are smart, curious, active and agile. Depending on your bird’s specific species, your avian sidekick may have intelligence equivalent to a two-year-old or even older child. If you’ve ever spent time around young children, you know that they can get themselves into all kinds of trouble in no time flat. The same holds true for parrots. Creating a safe play space for your parrot includes choosing the safest DIY parrot toys for playtime. When choosing DIY parrot toy materials, anything labeled as “human food grade” is often the safest bet. When in doubt and whenever possible, always supervise your parrot during play time, especially with new toys! Here are some safety concerns many parrot owners encounter when selecting materials for DIY parrot toys. Parrots love color! Your bird has keen eyesight in the full color spectrum. But not all dyes and colors are bird-safe. Look for FDA-approved food-grade dyes or dyes made from fruits and vegetables. You likely discovered quite quickly that your parrot loves to chew! You just need to make sure to provide bird-safe chewing materials that are free from adhesives and treatments such as paint, varnish, glue, anti-pest chemicals and similar toxins. Different parrot species have different beak strengths. What might be impossible for your cockatiel to bend or twist may be a moment’s work to the super-strong macaw! What is important is to be sure the fastenings you choose – such as chains, ropes, hooks, and clips – are safely blunt and do not pose any kind of entrapment risk. Metal poisoning is one of the biggest concerns to watch for. Even simple things like twist-ties may contain lead or other toxic metals. Always opt for plastic, acrylic or natural wood for your DIY parrot toys. Steer clear of metal unless you can definitively identify its source. This is especially true of bells, which are also dangerous for other reasons besides the metal used to create them. Bells, chains and blocks are often used to make DIY parrot toys. Depending on the size of your parrot, those small slits and openings on the sides and underneath certain toy materials may create a risk of your parrot getting something caught inside — a foot, a toe, or even his neck, wing, or tongue. Holes of any type in any parrot toy material or fastening should be carefully evaluated for safety! Some materials – wood, paper, cardboard – are made to be chewed. Other materials – metal, plastic, acrylic – may be chewed anyway. But where natural paper/wood tends to soften when chewed, many human-made materials will not. This means your parrot may ingest sharp shards or fragments that could cause dangerous punctures internally. Your parrot might love picking apart the fibers of cotton rope. But the fibers can become dangerous or deadly if your parrot gets an appendage caught or ingests any of the material! These materials are considered safe to use for your DIY parrot toys projects. Plastic C-Clip Hooks. These hooks are called C-clips because they are shaped like a C with one end open. If by chance your parrot does get any body part trapped inside, the soft malleable plastic will easily bend to release. Kaytee Superpet Apple Wood Sticks. Fruit woods are generally safe as long as the wood is not treated. Look for products labeled organic or all-natural. SGT Knots Sisal Rope (various widths). This natural sisal rope is the same material used to make cat scratching posts. It is organic, durable and resistant to mold and mildew. Elmer’s All-Purpose Non-Toxic Glue. If it is safe for kids, it is typically considered safe for parrots. Although, of course, you want to make sure neither gulps down the whole bottle! Stock Show Rattan Bird Balls. Made with kid-safe Easter egg dye, these rattan bird balls are brightly colored. They’re perfect for making foraging toys. Paradise Wood Slats Bird Toy. This company makes an assortment of bird-safe wood slats, blocks, popsicle sticks, leather strips and other supplies. All great for making DIY parrot toys for birds of all sizes. Wesco Bird Kabob Yucca Parrot Chips Bird Toy Parts. These natural yucca sections are a popular choice for foraging and shredding toys for parrots of all sizes. Super Bird Creations Finger Traps. These colorful, crunchy finger traps are always a parrot toy favorite and they are easy to work with, and to replace after your parrot has chewed them to smithereens. In addition to parrot-safe materials available for purchase, chances are good you have some awesome materials tucked away in your own cupboards right now! Recyclable paper (make sure any ink is parrot-safe). Empty paper towel or toilet tissue rolls (make sure there is no adhesive). Empty egg cartons, tissue boxes, shoe boxes. Wood blocks that are child-safe. Natural wood wicker baskets or mats. Natural untreated wood that is parrot-safe. Zip ties (much safer than twist ties for securing things together). 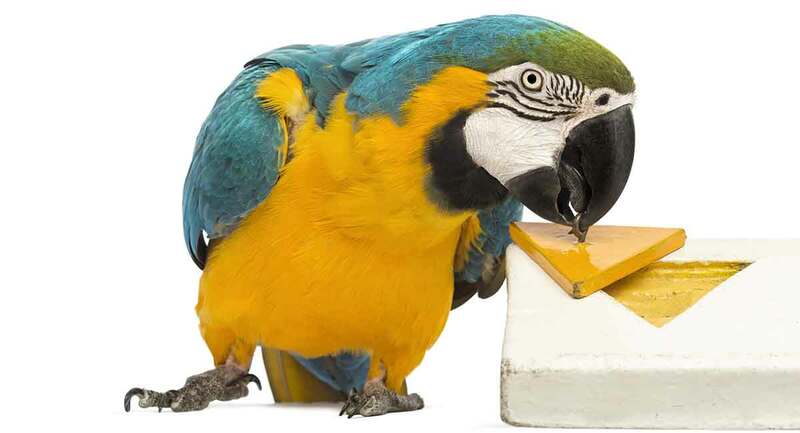 Your parrot probably doesn’t need a second invitation to chew anything that comes within beak range! So what about some toys that will encourage chewing on parrot-safe materials and safeguard your valuable home furnishings? 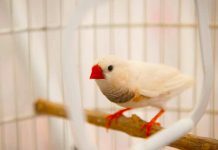 You can use sisal rope or plastic zip ties to secure single larger chewables to the side of your bird’s cage. For instance, a wooden spoon with a hole at the top or a length of empty paper towel roll can be secured to your parrot’s cage with a zip tie to hold it in place as it gets chewed up. 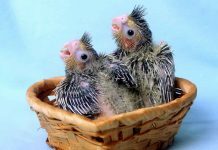 You can also thread a variety of chewables onto a length of sisal rope – finger traps, yucca kabobs, paper towel and TP rolls, wood spools, millet sprays, even fresh herbs and greens – and tie it tightly to your parrot’s cage for chewing fun. Take a length of sisal rope and layer on two or three coffee filters to one unwaxed paper cup. You can crumple up the paper cup a bit for smaller parrots. This will make a handy non-food chew toy. Thread one spool to one block onto a length of sisal rope and secure it to your parrot’s cage. For smaller parrots, substitute sections of colorful paper or corrugated cardboard or bird kabobs for the spools and blocks. Fill the empty compartments in the bottom section of an egg carton with a selection of edible and non-edible chewables – yucca pieces, edible flowers, popcorn (plain, no salt or butter), healthy greens, corrugated cardboard squares – and let your parrot have fun exploring and chewing it all up! Foraging is how wild parrots find food! They will hunt and peck around for seeds, grains, vegetation, small insects, flowers and nectar. Foraging is a deeply satisfying instinctual need that all pet parrots still have. Just like any other pet, parrots can become overweight, so it is important to remember that you don’t have to use food as a foraging incentive. Shredded paper is also a great foraging material as are natural wood sticks. These are also the types of materials your parrot might use in nature to build a nest. Gather some fresh herbs and greens. Use a length of sisal twine to secure them together and tie it to the side of your parrot’s cage. This is a great way to get picky parrots to eat their greens! Stuff some colorful crinkly confetti paper, finger traps, adding machine paper or muffin cups into each end of an empty toilet paper or paper towel roll. Get a plain, clean piece of untreated wood or a plastic serving tray – either can serve nicely as a base for foraging DIY parrot perch toys. Sprinkle some millet or some of your parrot’s favorite treat food on it, then add a few shiny safe-metal spoons, wood blocks, larger clean rocks, yucca kabob pieces, wood spools and crinkly paper and let your parrot hunt for the treats. A dog treat ball works great for this or you can use an appropriately sized rattan bird ball. Stuff the ball with crinkly confetti paper, Lego pieces (not too small! ), small bits of fruits or greens, finger traps or small sections of millet sprays. Take a sheet of plain safe paper and ball it up in your hand until it is wrinkled and crinkly. Then add a bit of your parrot’s favorite treat food in the center and ball it up tightly. Encourage your parrot to unwrap the “present” to get the treats! Not everyone has the time or inclination to assemble DIY parrot toys completely from scratch. Plus, it can be fun to learn about how to make your own DIY parrot toys by using pre-assembled kits. These can then give you other fun ideas for materials to incorporate after you see what your parrot likes best! This fun and colorful DIY parrot toys kit comes in small, medium and large sizes so you can make a toy that is suitable for your parrot’s strength. This DIY parrot toys kit comes in small/medium, medium/large and medium/extra large. Each kit will make 4 separate parrot toys that are colorful and enriching. The macaw is the strongest parrot species on the planet. To get a sense of the raw power in a macaw beak, you can take a look at how this hyacinth macaw (rumored to be the strongest of all the macaws) bends the cage bars like butter to escape! Suffice it to say everything you give to a macaw, including DIY macaw toys, must be bigger and stronger than what you would offer to a different parrot species. However, when in doubt, always assume that even a pint-sized parrot is stronger than she looks. Size up the toy for safety! We hope you have had fun learning about how to make these DIY parrot toys to enrich your parrot’s daily life with you! Let us know what works for you and your pet! Castle, J., “Safe Parrot Toys,” Best Friends Society, 2018. Johnson, A., “Bird Toy Materials and Safety Tips,” Birds N Ways, 1996. Pepperberg, I., PhD, “Bird Brains: Are Parrots Smarter Than a Human Child?,” Scientific American, 2008. Kersting, D., DVM, “Homemade Toys,” Bird Medicine and Surgery, 2018. Powers, L., et al, “Basic Pet Bird Care,” Association of Avian Veterinarians, 2016. 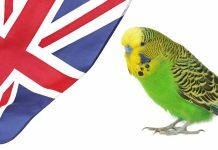 English Budgie – Is This Cute Bird Your Perfect New Pet?